This mining instrument, known in German as a Schinzeug, carries two small compasses inset in its face. The compasses are aligned with each other, presumably as a double check that no local magnetic effects were causing unexpected deviations underground. The instrument is supplied with two plumb levels which fit in a central hole. Each is equipped with a short brass scale which indicates the distance of the bob from the vertical. All the parts are housed in box whose compartments are carved out of solid wood. 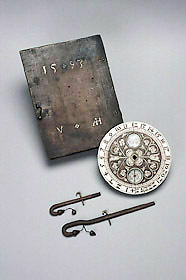 The lid carries the date 1593 and the initials 'V AH', while the base of the compass has the initials 'V A'. The instrument may therefore either have been made or owned by someone with the initials 'V A', and who perhaps came from a town whose name begins with H.